Posted byDr Helene Lavoix (MSc PhD Lond) November 16, 2012 October 31, 2017 Leave a comment on Pattern – Towards Polarization in the Western World? The pattern that has been emerging over at least the beginning of the second decade of the twenty-first century is a rising polarization within Western society – or societies. In this article, we identified and analysed the trend through the related signal – the 14 November 2012 strikes. We evaluated the evolution toward polarization as likely. We then assessed that we shall likely see more demonstrations and protests in the near future, which will probably expand in terms of participation, geographical scope and content of demands. Dismissal – easily interpreted as despise – absence of satisfying answer and feeling of unfairness will most likely enhance tension, opening the door to violence under various forms. Subsequent and current dynamics and events have proven our estimate was correct. We do not see an end to this trend in the near future (Oct 2017). As a consequence of the responses given by governments to the financial institutions and sovereign debt crisis, austerity policies, protests have spread throughout the Western world since March 2011. On 14 November 2012 a Europe-wide strike was organised and saw millions of demonstrators taking to the streets with variations according to countries. The demonstration shows a rising coordination across countries and mobilization of citizens. It is however still mainly peaceful despite sporadic violence. The general demonstration occurred as the Euro zone was not yet considered as being in recession. However, as now recession is official and expected to last, then the causes for the mobilization remain, letting us expect more protests to come. If peaceful protests are, however, considered as useless, notably by the conservative and liberal financial establishment, then it is most likely that demands will not be heard, and worse, that peaceful demonstrations will be dismissed. It may be seen as the real response to the demonstration, actually a hardened position. As recession may also increase the fear of diminishing profits, then a softening posture is unlikely. Furthermore, one may also imagine that a continuing recession added to failed efforts by demonstrators to bring about change would be an opportunity to actually increase profits – and power – on the short and medium term by breaking any opposition, thus by changing the second half of the 20th century related balance of power. This would also imply a tendency towards a harsher position. 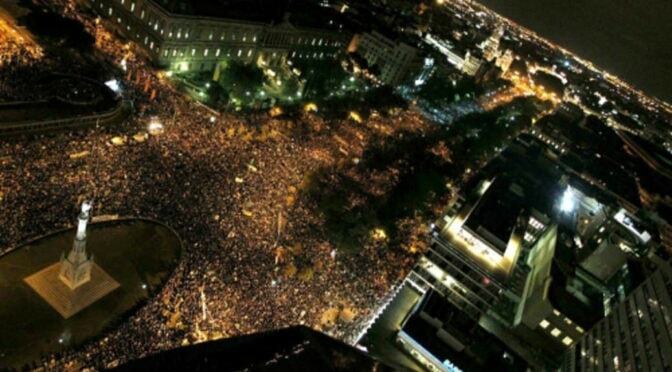 Featured image: Madrid Demonstration on 14 November 2012 from #14N: millions join largest European strike ever by Jerome Roos.